Edit: Btw I have a clean install ,only nessecery drivers installed. Doh. I ran it again and it's now 6331. I guess it is my video card holding me back. Okay. Hopefully, I can run UT3 just fine when it comes out. This any good for a system like mine? Keep in mind I didn't downgrade any graphics stuff (themes and visual enhancements), or turn off my NOD av, etc. when I ran it. guys make sure google desktop is off as well, I found it to affect performance when running. I think I get 5000-6000, I will have to DL and try it again, its been a while. 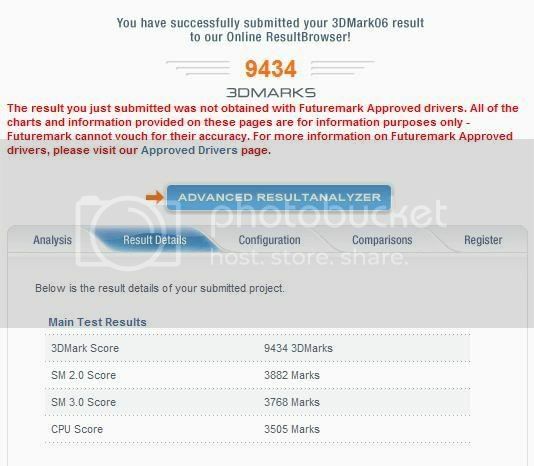 My bad, I lied, I get 4257 3DMarks for my system. Check my signature for the specs, I score 3600-something with OC GPU and stock CPU (1024x768, noAA, noAF). Your score seems really low. Even OC'd your video card should be giving mine a run for its money. And your CPU definitely dominates mine, hands down. omerome: i score 7024 with a quadcore q6600 @ 3ghz and a x1900xt 512mb overclocked @ 690 core and 850mhz (1700mhz) memory. so i guess your score is about right for that card if it is running stock. OVERCLOCK THE HELL OUT OF IT! update drivers? clean out dust use ccleaner kill off background apps? I ran it once with no overclocking and got a 9687. I dunno, it seems to work well enough. We'll see what it goes to after I OC it some. BTW how high should I have settings on when I run it? I have everything at the highest including AA and AF. Not bad for an 8500GT. I changed some settings and just pulled 10,517.